Eagan’s schedule this season has been good-but-not-great. Could the same be said about the Wildcats? 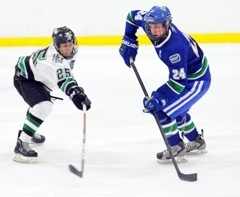 Eagan has two losses – and more than a few doubters as both setbacks came in the Wildcats’ only two games against bona fide top 10-ranked teams (Eden Prairie and Minnetonka). With the section playoffs fast approaching, No. 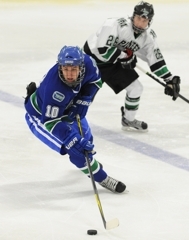 4-ranked Eagan’s trip north to Aldrich Arena in Maplewood to play No. 10-ranked Hill-Murray (12-6-0) served as an ideal sparring session against another team heavily favored to reach the state Class 2A tournament. Glienke and linemate Cullen Willox, also a junior, each had a goal and an assist in the third period of the Wildcats’ 4-2 triumph over the Pioneers on Tuesday, Jan. 31. 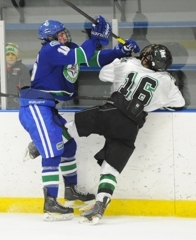 “It was a great statement win, to show everyone we’re still up there,” Eagan senior defenseman Eli May said. In a game in which the first four goals were scored on special teams, it was the even-strength work of Willox and Glienke that powered the Wildcats (18-2-0) to victory. 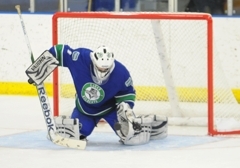 Their third-period passing and finishing allowed Eagan to break a 2-2 tie and cruise to the confidence-boosting victory. Meanwhile, Eagan’s line featuring seniors Michael Zajac and Will Merchant was effective in limiting the damage inflicted by Hill-Murray’s top line featuring the speedy, crafty Jake Guentzel. The way Eagan coach Mike Taylor sees it, he has a line 1 and a line 1a. Take your pick as to who is who, considering the Nick Kuchera, Glienke and Willox trio has outscored the Merchant-Zajac-plug-in-another-forward-here combination. Eagan’s depth was integral in its victory Tuesday. With leading scorer Nick Kuchera sitting out a 5-minute major and 10-minute misconduct for checking from behind, the Wildcats moved Will Peterson from defense to forward to replace Kuchera on the forward unit with Glienke and Willox. The plug-and-go move worked, as Glienke and Willox were just as effective creating scoring chances with either Kuchera or Peterson on their line. Throw in one of the state’s deepest and most skilled defensive corps, and the Wildcats proved they belong in the upper crust of state teams. “We don’t really have a top line right now,” said May, who also had a goal and an assist. “Obviously we have got special talent on both lines and they are clicking. Everyone is finding each other. 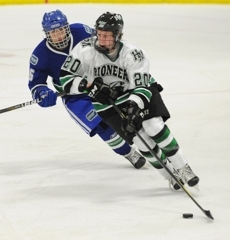 Eagan and Hill-Murray don’t run in the same circles. The Wildcats and Pioneers play in separate conferences and sections. The teams’ home rinks are separated by 27 miles and plenty of high-caliber opponents. 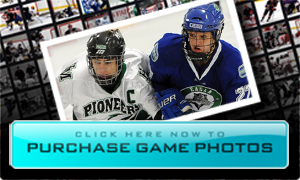 Well, Eagan is a senior-dominated team with aspirations of winning a state Class 2A title. The Wildcats are hungry for state-caliber, state-ranked opponents. Hill-Murray, which has beefed up its non-conference schedule the past few years after reducing the number of Classic Suburban Conference games it is required to play, also has been on the lookout for high-caliber foes. Eden Prairie has been added to the Pioneers’ schedule each of the past two years. Hill-Murray will play Lakeville South later this season. On Tuesday, the Pioneers and Wildcats met for what was believed to be the first time. 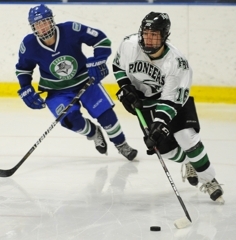 Hill-Murray coach came away from the 4-2 loss at Aldrich Arena hoping for a rematch. The sooner the better. Of course Lechner is fully aware a “later” matchup this season would have to come at the state tournament. 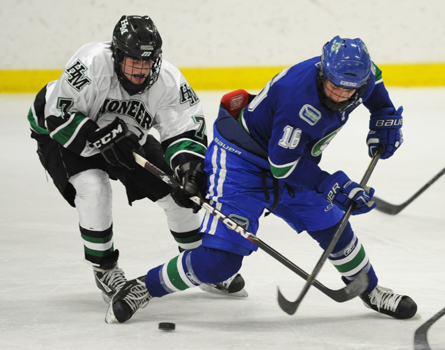 Eagan coach Mike Taylor admitted his team was in danger of losing itself in the third period. 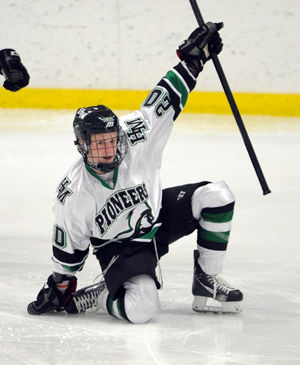 A Hill-Murray goal led to Wildcats players barking at a teammate who blew an assignment. 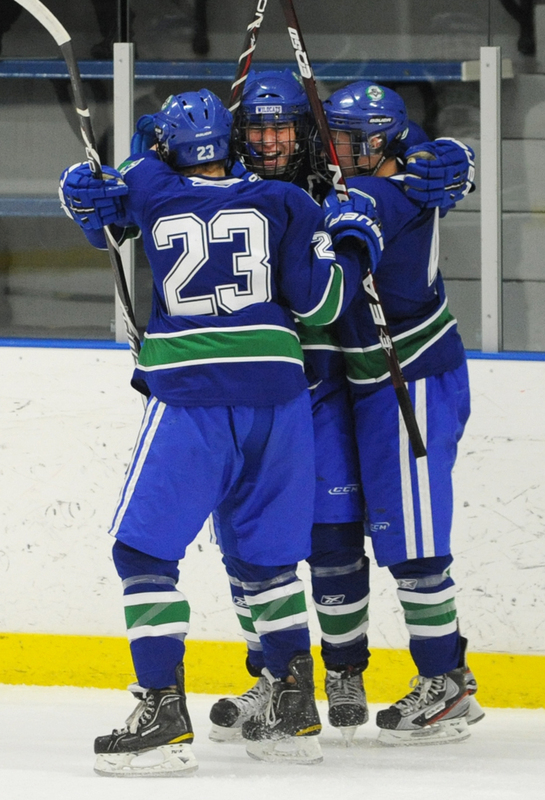 The unrest turned to euphoria, however, as Cullen Willox scored what proved to be the game-winner in a 4-2 Eagan victory on Tuesday at Aldrich Arena. No. 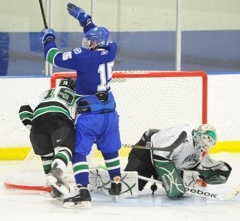 4 Eagan (18-2-0) won its 10th consecutive game, beating No. 10 Hill-Murray (12-6-0) with a two-goal rally in the third period. 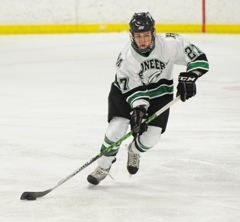 Hill-Murray forward Jake Guentzel scored his second power-play goal of the game at 3 minutes, 9 seconds of the third period to tie the game 2-2. The rink announcer barely completed his call of the scoring play when Willox responded with a goal just 44 seconds later to put the Wildcats ahead 3-2. Eagan got the better of those swings. From the Wildcats’ perspective, the second period started badly and seemed in danger of getting worse. Guentzel’s first goal tied the game 1-1 on a power-play goal just 57 seconds into the period. Eagan’s Nick Kuchera later drew a 5 minute major and 10 minute misconduct penalty for checking from behind at 11:53. 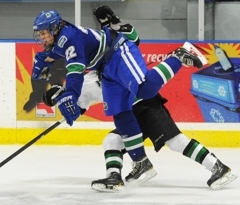 In danger of falling behind, Eagan instead went ahead 2-1 as Will Merchant forced a turnover at the Wildcats’ blue line. He streaked up the ice and buried a shorthanded breakaway at 13:41. Inspired, Eagan killed the remainder of Kuchera’s penalty. Trailing 3-2 after Willox’s goal in the third period, Hill-Murray became the aggressors and seemed poised to put a third goal past Eagan goaltender Christian Butler. Instead, the Wildcats mounted a final rush. Zach Glienke, staying onside, scored the clincher with 56.1 seconds left. 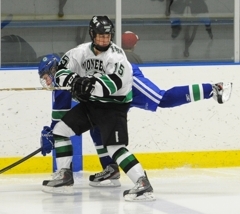 Eagan's Eli May scored the game’s first goal on a power-play at 6:35 of the first period. The junior forward set up linemate Cullen Willox’s winning goal early in the third period with a perfect feed from the corner, then capped the night with a goal of his own in the final minute on a nifty deke. Glienke has scored 21 of his 28 points in the Wildcats’ last 10 games. He's had multi-point performances in seven of those games. Guentzel, a junior forward, scored twice while quarterbacking the Pioneers’ power play, with both goals coming on slap shots from the point. Guentzel’s two goals boosted his team-leading point total to 35. A senior forward, Merchant scored a gorgeous breakaway goal while the Wildcats were killing a 5-minute major penalty to Nick Kuchera in the second period. Merchant put a series of moves on Hill-Murray goaltender John Dugus before snapping his wrists and launching the puck into the upper right corner of the net.